LH III2a- all the cool kids are doing it these days. Er, more accurately, all the cool kids were doing it 3,325ish years ago. Same thing, pretty much. Before I confuse anyone even more, I’ll tell you what I’m up to here. “Nail Art History 101” was a little too modern for my tastes (and nail polishing skills), so I thought we’d take it back…way back. To the Mycenaeans! This all started when a friend suggested I do nails inspired by ancient trade goods, which has tons of exciting potential (jade! iron! carnelian! lapis lazuli! 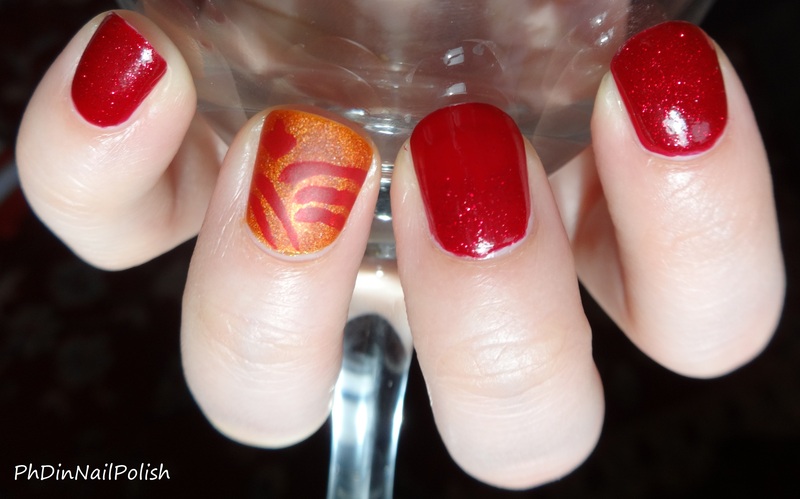 ), and after attending a thoroughly non-ancient symposium this past weekend, I thought I’d try my hand at doing some wine-inspired nails. Explanation: in ancient Greece, a symposium involved a bunch of guys getting together and broing out, talking about deep subjects, and drinking wine from special cups called kylikes until thy were good and soused. Modern academic symposia mostly involve a series of educational talks and enlightening discussions, generally with less wine and fancy crockery. Isn’t it awesome? Mycenaeans are awesome. 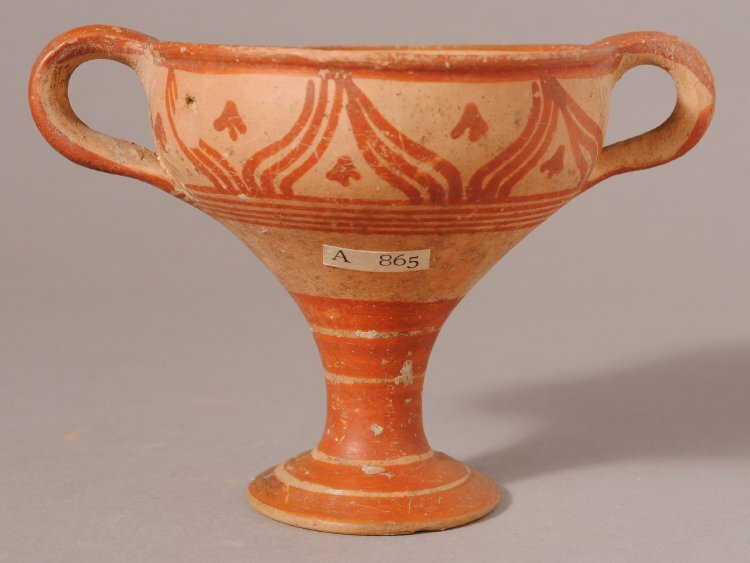 And for the record, LH III2a refers to the specific style of pottery (“Late Helladic”, sub-group III, sub-sub-group 2, sub-sub-sub-group a), which is one of the ways that researchers can tell when it came from (in this case, approx. 1375-1300BCE). Definitely check out of the info on this kylix– Google the lordly 19th century British excavator, map the find spot, figure out what a Furumark Shape might be! Ok, now to the nails. I started with Ciate “Dangerous Affair”, a sheer-ish red creme to channel wine. 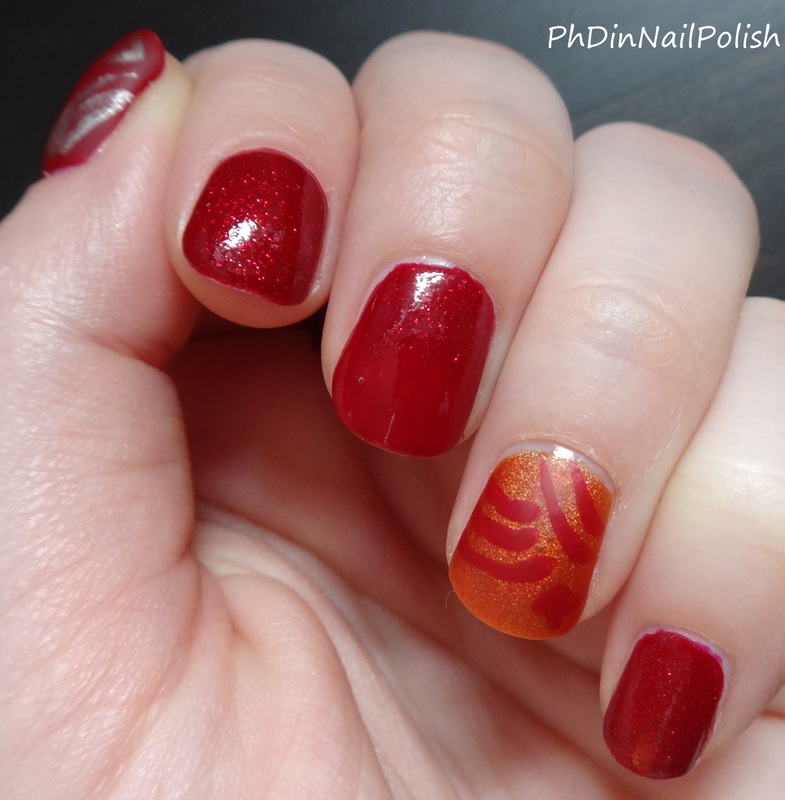 Then I added a layer of Beautifully Disney “Star Struck” (red glitter in a red jelly base) to the pinky and pointer fingers. 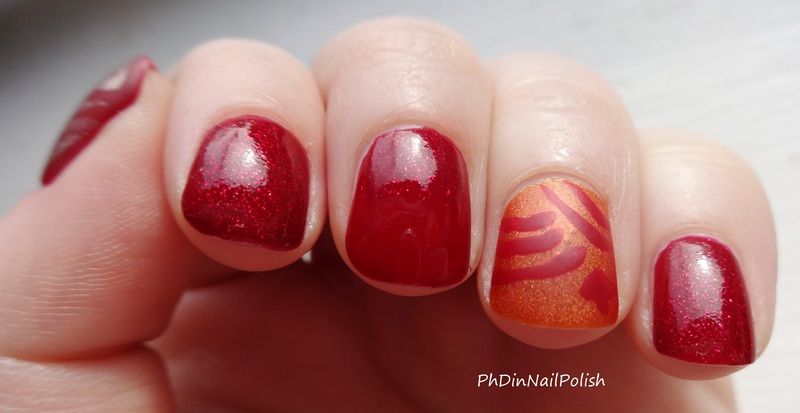 The middle finger got a “Star Struck” glitter gradient (let’s say that was because I was thinking about wine being ported across the Mediterranean in the ancient world). 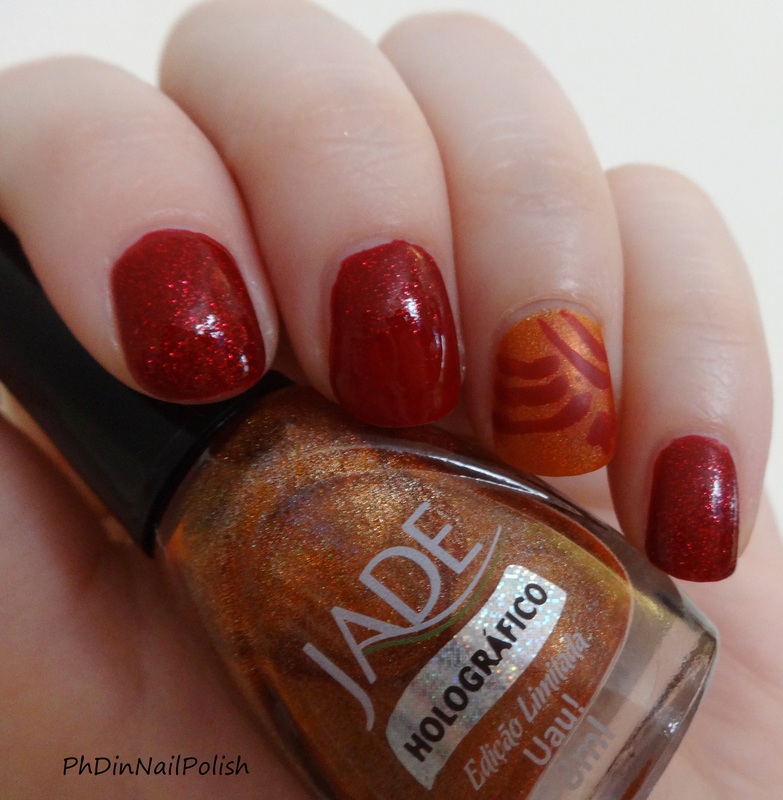 On the accent nail, I went for “kylix” by starting with the orange holo “Uau” by Jade and hand painted designs using Essie “A List”. 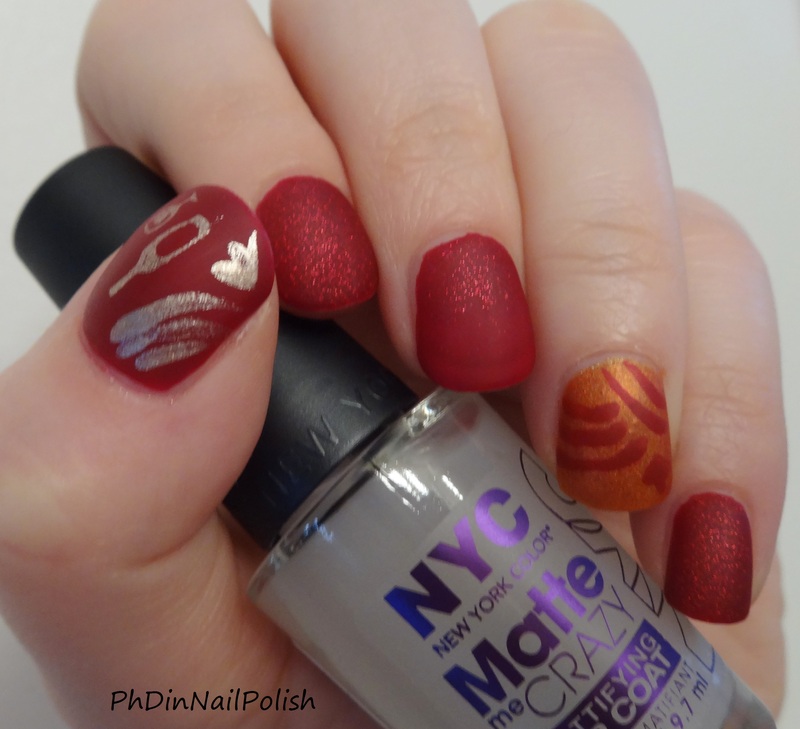 Then I matted it using NYC “Matte me Crazy” to give it a rougher, more pottery-like finish. 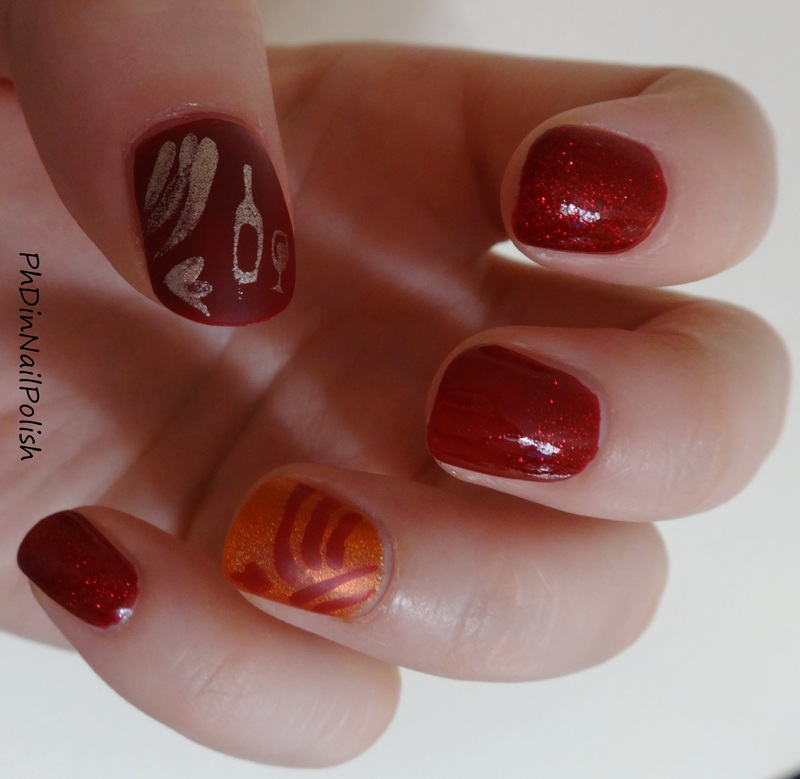 On my thumb, I hand painted some more Furumark 62 inspired designs with Julep “Zelda”. 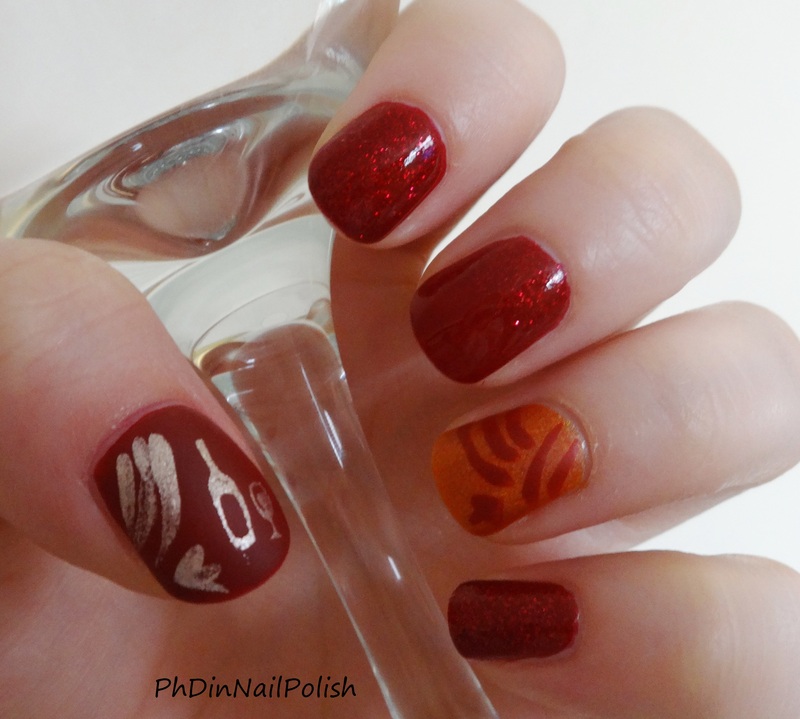 I also used a MoYou Tourist Collection plate to stamp on a modern wine bottle/glass design just to keep the theme going. I’m not entirely sure how I feel about the modern/ancient mixing, but then again I’m already trying to use nail polish to communicate about ancient trade goods, so who am I to quibble? I also got overly excited and tried my hand at “artistic” photos. This, people, is why I am not an artist (art history, art; not the same thing). I also tried my hand at making everything matte, just for the sake of it. For some reason, this made it seem even more sheer, but it does make the glitter look snazzy. What do you think? Should I stick to prehistoric subjects? Want to see something more modern? Are you holding off judgement until I attempt something like the Lascaux cave paintings? 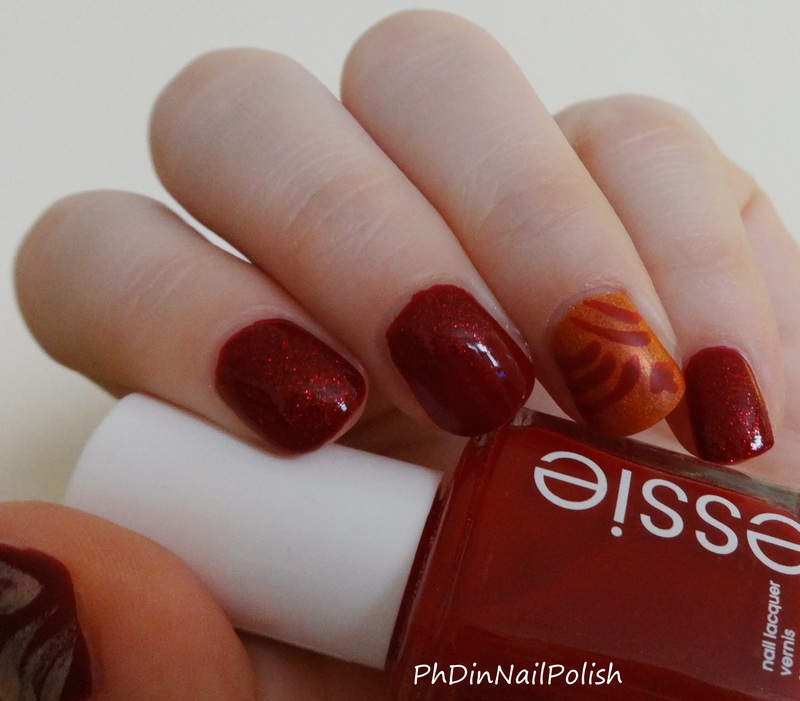 Wish there was a little less PhD and little more polish? Have suggestions for what I should do next? Do I need to tell you how much I *adore* this post???? It appealed to the girly scholar in me. 😉 Fantastic! !